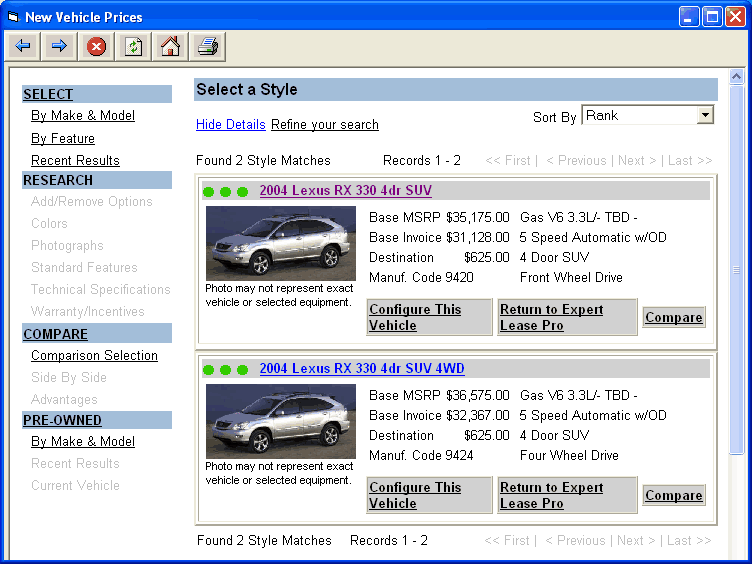 Why do you need auto leasing software? Why spend the money? Car dealers can use payment calculator software to out smart you, scam you and drive up the cost. 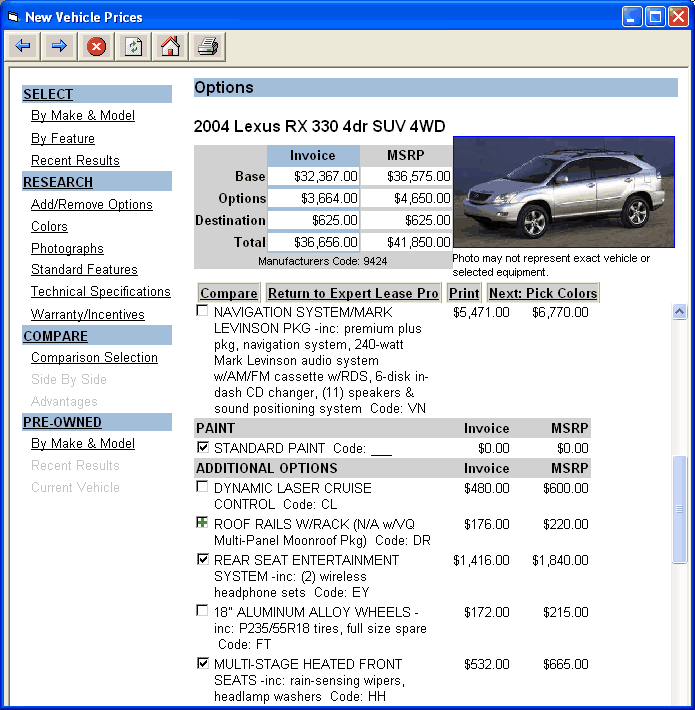 What car lease software are you using? You should be using the same type of software they do to fight fire with fire. It will help you look up pricing, lease versus buy calculations and payment calculations. It's crucial that you are able to check the dealer's numbers. 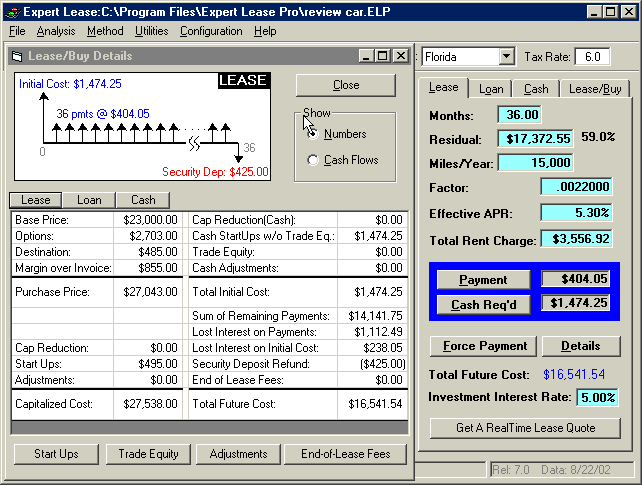 Here we review Expert Lease Pro from Chart Software, which gives you phone support and analyzes your deal for free. 1. 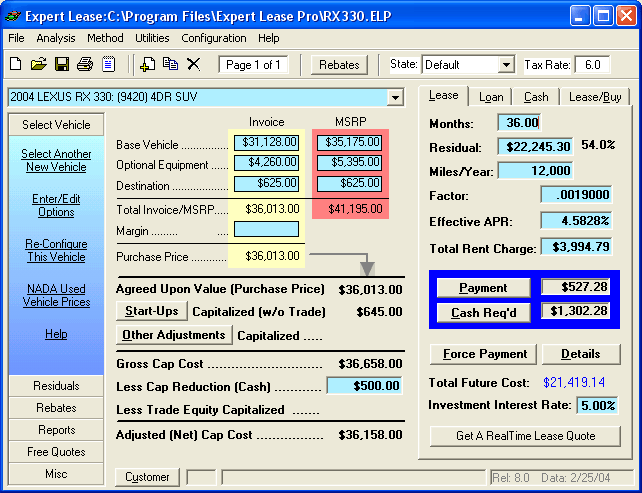 Why do you need auto leasing software? Why spend the money? A lot of parameters affect your payment. Calculations are confusing even for dealers so they rely on software to do it. If you think you don't need it and you don't want to spend the money on one, fine, you'll spend $2,000 or more extra on your deal. Florida's Attorney General - "Consumers wishing to terminate their lease early would call Ford to ask what the early termination penalty would be. Ford would refuse to tell them, sending them to the dealers. The dealers would then overcharge them for the penalty by $300-$2,000! This is just one type of payment packing scheme that car dealers have available to them." The attorney general said investigators believe Ford Motor Credit may have provided training and materials to Ford and Lincoln Mercury sales employees to help them exploit consumers. We don't want to pick on Ford, this can happen anywhere. You must be diligent in protecting yourself. Car dealers know what your lease payment should be, they can quote you $20 more per month, you have no way to verify it, and you're happy with the numbers, so you sign, not knowing you got duped! 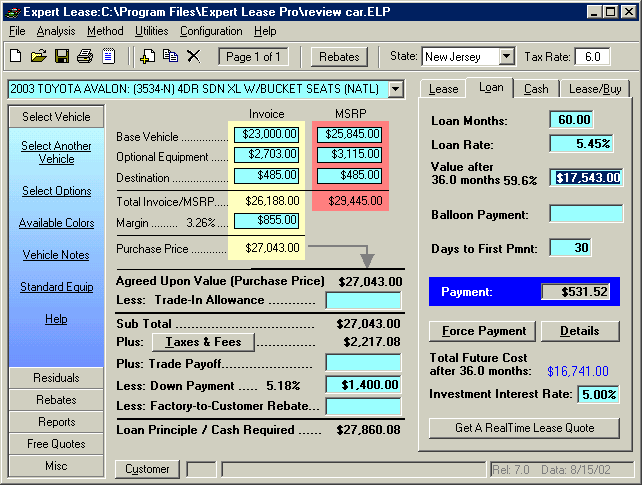 Without leasing software you're sailing the ocean of confusion and dealers will swallow you whole. You should use software to study the cars you are interested in, so that you'll know the deal better than the salesman. Remember, they are using similar software to scam you. Lots of people ask me where to get residual values from. Previously we had no way to get data, and so thousands of consumers were ripped off. Luckily now it is available in the software packages. I can't tell you how many times people have emailed me that they used auto leasing software and caught the dealer packing payments. The salesperson always blamed their computer. I get email from many visitors who paid MSRP after the dealer lied to them, saying they were getting a $3,000 discount. If you don't check their math, you can get ripped off. Some dealers tell you the money factor is .003 (8% APR), when it's really closer to 18% APR. Calculator software works backwards to discover that they lied about APR and exposes their scam. "I leased the Highlander yesterday... I would like to thank you for not only developing an excellent, user friendly software but the special attention and time you devoted to making me understand and walk me through the entire leasing process. I ended up saving at least $3,000 on the whole deal (cost of the vehicle, fees, charges etc)." Buy directly from Chart and download to use now, and determine your lease payments before seeing the dealer. Their Leasing Hot-LineTM technical support gives you assistance with questions on leasing or buying. Spend $59 now and save thousands in lease rip-offs. Based on complaints i receive, the average scam siphons $1,500 from the buyer. A common scam is stealing your trade-in by fudging confusing numbers on the contract, which most people don't read. CarBuyingTips.com has affiliate relationships with multiple web sites. We are paid referral fees for leads or sales generated from visitors that click on some links or fill out certain forms on this site. Please view our advertising policy page for more information. Copyright © 2019 ConsumerNet, Inc. CarBuyingTips.com® is a registered trademark of ConsumerNet, Inc.